we had a very leisure sunday morning. 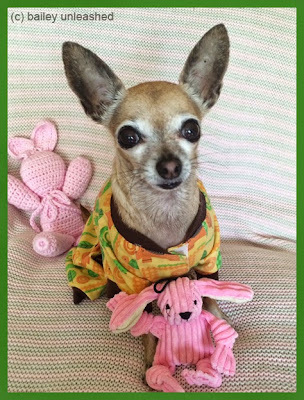 bailey hung out in her pjs and had a very hoppy easter with two new bunny toys. she got a handmade crocheted bunny i picked up at an art faire and a wee hugglehounds bunny (from kibbles place of course). after brunch, bailey got dressed up in her new handmade easter dress (also from the art faire). i decided to go a bit retro this year with polka dots and cherries, instead of the traditional pastels or florals. since most places were closed yesterday, we decided to go out for a leisurely stroll. 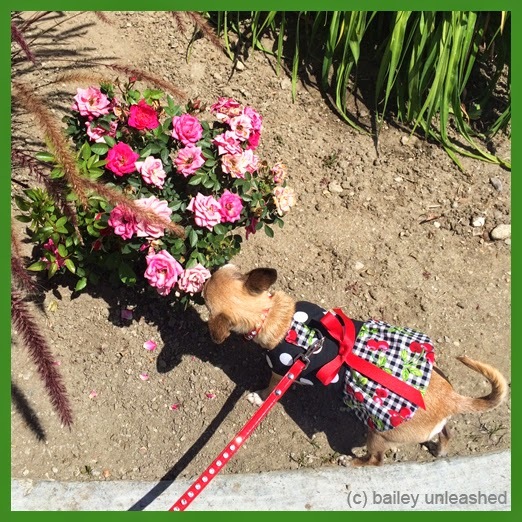 bailey is loving life and takes every chance she gets to stop and smell the roses. 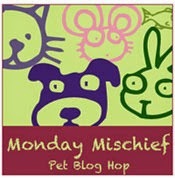 My Ethel has the pink bunny that is in front of Bailey in the second photo! She LOVES it! Looks like a real nice Easter. Still amazed at how "normal" you are already! We can't decide what we like more, your pjs or new dress! Lovely!! 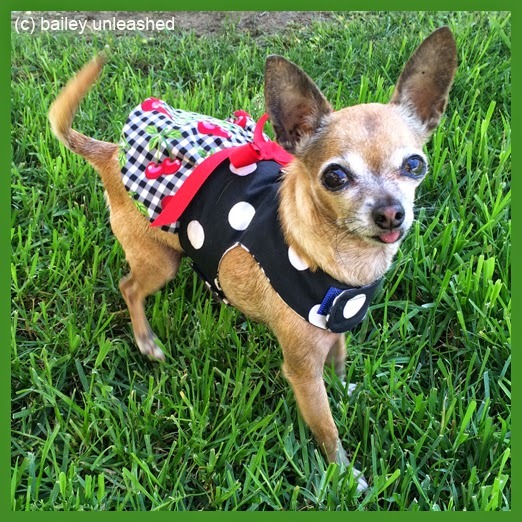 What a cute Easter dress! That third photo is so funny! 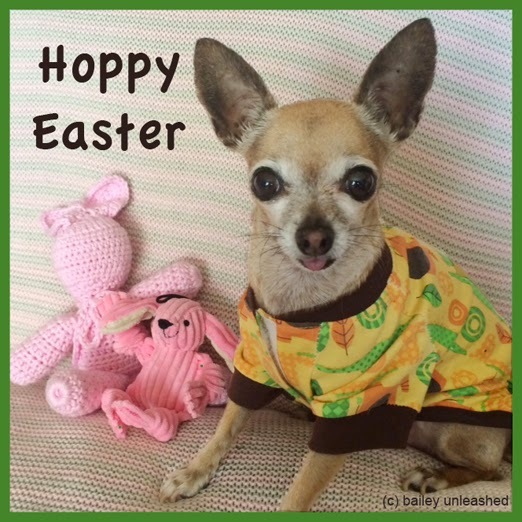 Cute bunnies and loving your Easter best. Aww, what a cute girl :-) She rocked the polka dots! I personally love taking every occasion I get of smelling roses as well ~ they're my favorite flowers! That whoo hoo picture is spectacular! Love it! 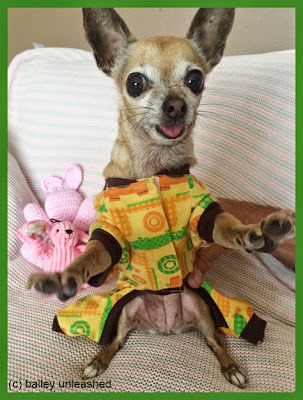 OMD, OMD, those pics are just too cute gurl!!!!! Looks like you had one FABulous Easter!!!! The beautiful eyes tell me that you are doing so well. When you were sick your eyes did not look like this, but little by little you have gotten so much better, please be careful so you don't fall again. You look adorable in your sweet Easter dress. Bailey, you've got the coolest clothes! Your closet must be huge!